vi, 645 p. : ill.; 24 cm. Includes bibliographical references, discography (p. -589), videography (p. 589-591), and index. The scope is enormous. 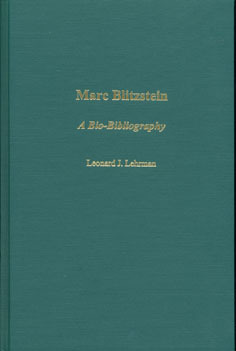 It includes a brief biography of Blitzstein, including a genealogy; chronological list of musical works with bibliographies of studies, commentaries and writings about those works; a chronological list of text to the music; an alphabetical list of works with alternate titles; general articles; and information about performances of the works. There are critical analyses of works that are well worth viewing. At the end there are comprehensive discography and videography of Blitzstein’s music works. There is an index of names and organizations– something which in itself is valuable to anyone studying this period of music history. These listings are thorough, clearly laid out on the page with a well numbered system. This is not only a bibliography– it’s an annotated bibliography, including excerpts. There are often pertinent quotes from a given item, giving this book an incredible edge on scholarly inquiry. This is quite a valuable tool. All that being extraordinarily excellent, there is one major drawback to this work that cannot be ignored. There are way, way too many errata. Just too many publishing errors. The book came with an errata sheet that was extensive. The author has additional errata discovered since the errata sheet was published and made available. These additional errata Lehrman has listed on his website. Any library in a college, university or public library should have a student worker go systematically through all the errata and enter it into the book itself, in the right places. It will take hours, but be well worth it in the long run. Otherwise, no one can actually look up anything without referring to the errata sheet to see if there is something wrong with the entry you are viewing. There are so many of these, especially given the nature of the book as primarily a database of information, that if the errata sheet were ever lost, the book becomes significantly less reliable for the main purposes for which all that information is put together. For the amount of errors here, I do not know whether to blame the author or an editor at Praeger. Either way, it is really a shame. There seems to have been some information that came out or was made available only after the publication date. Still, how many opportunities will we have to get this amount of information on Blitzstein made so handily available? So far in WorldCat, there are only 101 libraries that have listed this book as catalogued. It is possible that some music libraries have opted out of purchasing this book because of this high error rate. That is a shame. Not only for Leonard’s years of work and dedication, but for future generations that will want to have this material handy for the study of this great American composer Marc Blitzstein. This is the most complete, up-to-date, and in-depth look at Blitzstein work and works about Blitzstein. My recommendation is still to purchase the book for a university library, but understanding some more money will be devoted to processing than normal.